Bacon and eggs aren’t just for breakfast anymore – not when you add pasta! Try this easy recipe for bacon and eggs spaghetti for supper tonight and watch them come back for seconds. This is most definitely a Thursday night recipe, and here’s what I mean by that. It’s Thursday. The weekend is so close, but so far. You’ve made your way through MondayTuesdayWednesday with a fair amount of energy, but by the end of Thursday, you are, well, TIRED. And every Thursday, the folks in your house are still expecting dinner. Sure, you could just scramble up some eggs…or you could turn to this recipe, which is quick, delicious, super-easy comfort food and a whole new spin on eggs for supper. Ready for a simple and simply delicious supper? Let’s make it! And even better, it’s made with things I’m almost positive you have in your kitchen right this minute, so bonus points for no extra trip to the supermarket required. Pasta (I used spaghetti but any long thin pasta will do). Eggs. BACON. And a little grated parmesan cheese. Cook up the pasta the way you usually do, just make sure to salt the water really well – and I mean REALLY well – and save some of the cooking water before you drain it. While you are cooking the pasta, cook the bacon until it is nice and crispy, and once it is done, cook your eggs up in the same pan. You can make them sunny-side-up or over-easy, as long as the yolk is still nice and creamy, because that’s going to help with your sauce. Bacon and eggs aren't just for breakfast anymore - not when you add pasta! 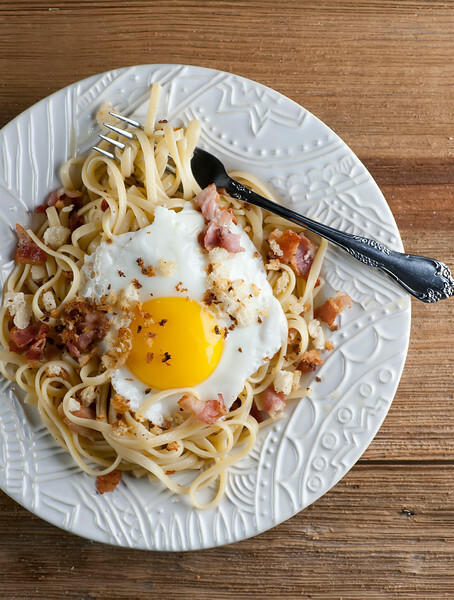 Try this easy recipe for bacon and eggs spaghetti tonight!Click to TweetNow toss the hot cooked pasta with the bacon, the cheese, some butter and enough of the pasta water to make a light sauce. Taste it and then add salt and pepper to taste…if your pasta water was salty enough, it might not need any salt at all. Divide the pasta among warmed plates, pop an egg on top of each serving and gently break the yolk so all the creamy goodness sinks into the pasta. At this point you can take this wonderful supper to even higher heights by sprinkling some fresh toasted bread crumbs on top, which adds that extra perfect bit of crunch. Twirl a bite around your fork and taste. Remember that tomorrow is Friday. Be very happy. Bacon and eggs aren’t just for breakfast anymore – not when you add pasta! 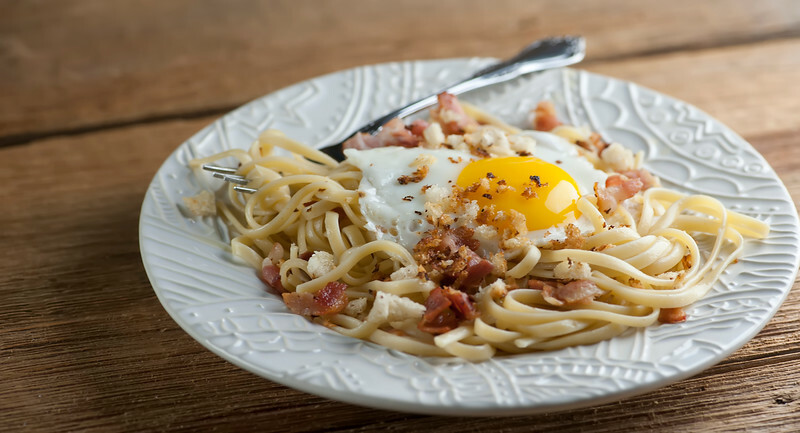 Try this easy recipe for bacon and eggs spaghetti tonight! Cook pasta in heavily salted water according to package directions. Scoop out a cup of pasta water before you drain it and set aside. Cook bacon pieces in a large skillet until crispy. Remove from the skillet with a slotted spoon and drain on paper towels. Cook eggs in the same skillet (yes, in the bacon drippings!) until soft set, about 4 minutes. You can cook them either sunny-side-up or over easy, so long as the yolk stays creamy. Remove from skillet and set aside. Add bacon, cheese, butter and pasta to skillet and add enough pasta water to make a light sauce. Toss, taste and and salt and pepper as needed. Divide pasta among plates, top each with an egg and break the yolk so that it melts down into the pasta. Garnish with toasted bread crumbs if using (I hope you are!) and serve! To make the bread crumbs, whirl a slice or two of fresh bread in your food processor and saute the crumbs in a small skillet with a teaspoon of olive oil and a little salt and pepper until they are golden. You can do this before you start the rest of the recipe so they will be ready at the end. Ooh, I[‘ll go you one better: I have leftover cooked angel hair pasta, just a quick dip in some boiling water and it’s done! This is why I always cook the whole packet — I just love the creative and quick things you can do with it for leftovers. I am ready to go! I do need a really thursday type meal today. I’m so over this week! It is 10 am where I live and I am wanting a bowl full of this Now ! This looks delish! I just recieved a gift of 4 lbs of bacon in the mail Tues. So I can crack it out tomorrow! Thank you. That is one amazing gift!! Yum! I have made many a plate of eggs with Spaghetti, but of course I should have thought to put Bacon with it. It looks fabulous! Hi Gwen – I’m so glad you found me! 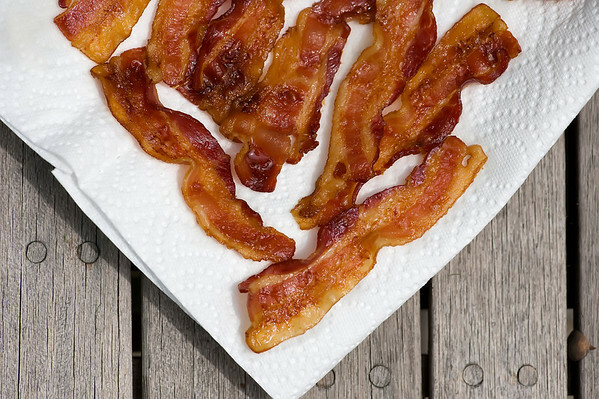 And yes, we definitely need to get on the list of whomever is giving out the bacon! This just looks so perfectly wrong – so wrong, in fact, that I can’t wait to try it one night for my nine-year-old and I when we’re especially pooped but need something quick and comforting. The only change I’ll make is to season with garlic salt – mmmmm. I love your blog. You truly love an egg as I much as I do I believe. Keep ’em comin’. I’ve got a few southern family members that will eat them (and beg for them) any way I’m willing to serve them! This is so good! I made it exactly as written and everyone enjoyed it. (Minus the breadcrumbs) So easy and so quick! My favorite kind of recipes! I’m happy to have another way to use up our fresh chicken eggs we get from our hens! Thank you! !